The MBA building is home to a large number of live animals which all require different and complicated things to survive. The biologists working with the live animals have been working to find the best ways to ensure that their specimens active and happy, not only for the creatures sake, but also to help improve the quality of the results their experiments yield. Cuttlefish are kept in the saltwater tanks, and the babies they breed require live prey to feed on. Mysida are an order of crustaceans, unique in their use of a kangaroo-like pouch to keep their live young in. Filter feeders, they prey on small planktonic species and pieces of organic debris, which they drag into their mouth using the front legs, and because of this are often a good sign of nutrient rich water, feeding heartily during algal blooms. In appearance, they are small shrimps, red or transparent in colour, and live around in world in both freshwater and saltwater. 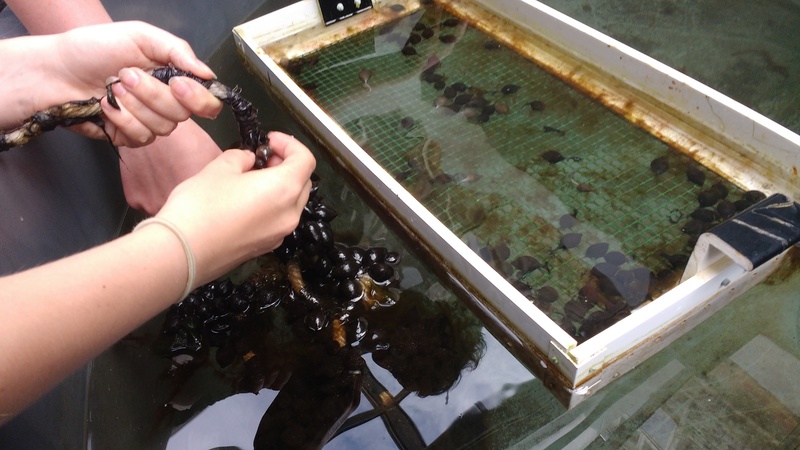 Their size, abundance and high nutritional value makes them the perfect food for baby cuttlefish, and we were sent out to a nearby estuary to catch some. At low tide, the tiny Mysids are so common that you can barely wave your net through the water without catching some, and sweeping through a cloud will quickly gather up hundreds of tiny, wriggling bodies. Setting out with bags of fresh water, we quickly swept up as many as we could, conscious that spending to long or overfilling the bags would mean the Mysids would run out of oxygen and soon asphyxiate. Luckily it was a good day for gathering them, and after only 20 minutes we had enough to feed the new-born cephalopods. Although we sprung several leaks on the climb back up to the bank, perseverance meant we lost very little of our precious cargo. Triumphant, we rushed back to the MBA building, wanting to get the new feedstock in a tank as soon as possible. 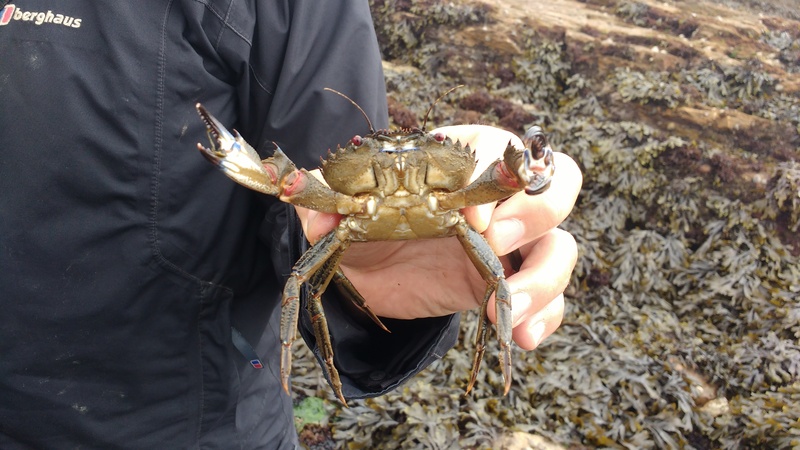 The Velvet Swimming Crab is one of the largest crabs that can be found on the British coast, preferring areas of sheltered shore, such as the crannies of the large slate formations across Batten Bay. Commonly found across Europe in the North Atlantic and Mediterranean, easily identifiable by the blue and red stripes around the eyes and carapace, and the tiny hairs across the back that give it the ‘velvet’ part of its name. It’s paddle like back legs allow it to swim in high tides, rather than being forced to scuttle on the sea floor. Extremely aggressive for a crab of its size, it is little wonder that these crabs are sometimes called Devil Crabs, and even as I held it firmly from the back, I could feel it trying to turn and assault my fingers. This is an example of some of the larger creatures that make up the Plymouth aquaculture, but there are many other species hiding under rocks, just out off sight. This summer, I have been selected by the MBA (Marine Biological Association) to spend a week in Plymouth doing work experience with them at their coastal Citadel Lab. 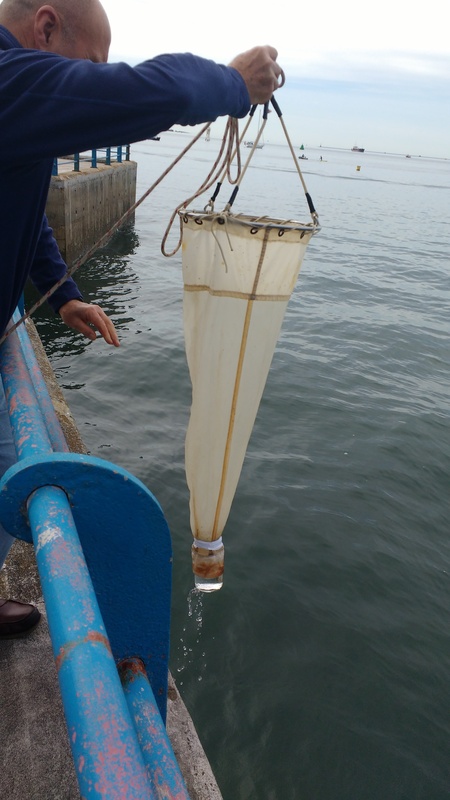 Five other aspiring marine biologists and myself will be participating in various surveys across the Plymouth coast and estuary, spending time studying plankton in the laboratories, capturing feedstock for captive animals and going out into the Plymouth harbour to do boat work. I am extremely proud to have been chosen for this experience, and am excited to begin working at the MBA building as soon as possible. 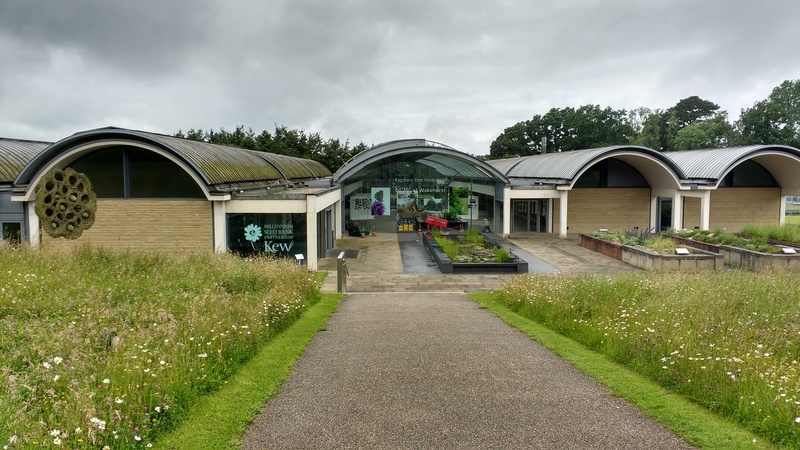 During my school trip to the Wakehurst Place Botanic Gardens, in which I learned about DNA extraction and performed surveys, the highlight was the visit to the Millennium Seed Bank, the largest collection of wild plant seeds in the world. The seed bank plans to prevent extinction of endangered, endemic or economically useful plant species by collecting a variety of genetically diverse seed samples, which can be stored for use in medical and biological research as well as replenishment of damaged species. In 2009 the Millennium Bank achieved its goal of storing 10% of all the world plant species, gathered from over 150 different countries, using their connections to 80 organisations across the globe. If they continue to progress at the rate they have been, they hope to have gathered a staggering 25% of all wild plant species by 2020. Once inside the building, we were taken through the intricate process that the seeds go through in order to last hundreds, or possibly thousands of years while still remaining capable of germination when needed by future generations. Orthodox seeds can be preserved through a slow drying, sucking the moisture out of them in order to slow down the metabolic rate of the seed, and thus allow it to live for much longer than normal. 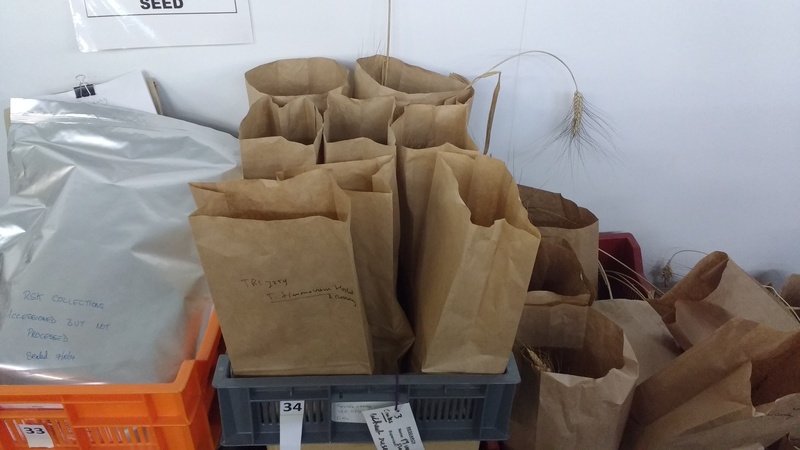 The seeds are taken to a drying room, kept at a constant 15°C and 15% air humidity, and left in small brown cloth bags until they are completely dry. The variety of seeds in the room is astounding, and looking at one stack of boxes alone, I see seeds from Mexico, Japan, Scotland, America and a colourful myriad of other exotic locations, showing the scale and depth of the project at Wakehurst Place. It is a simple yet effective procedure, with each percent of moisture lost lengthening the seed’s life by nearly a decade. We couldn’t stay long in the drying room however, as our mere presence was enough to send the humidity up, potentially damaging future seeds. After the seeds are dry and ready, the extra chaff and husk are gleaned away, using a variety of sieves and shakers, separating out the actual germinating segment of the plant. These seeds are then x-rayed to check for internal attack from grubs and moulds, which, if released into the seed bank vault, could do a lot of damage the chances of future plants germinating. 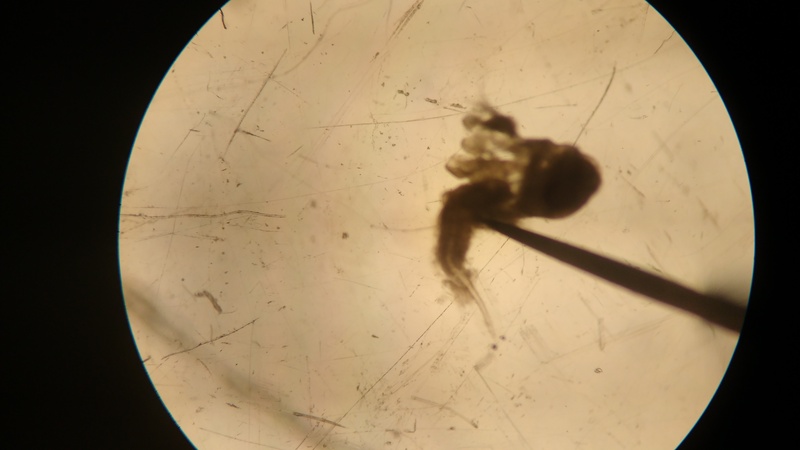 Recently, a new species of insect was discovered in the seeds here, a creature that survived and lived most of its life inside the seeds of this one particular plant, and had been caught when they examined the dried seeds for signs of attack. The now tested seeds can then be stored in the vault, a huge refrigerator kept safely behind colossal vault doors, underneath the Millennium building. The vault is like a bank, not only to protect the seeds from damage by the elements, but also because the net cost to replace the seeds in the bank is in the millions of pounds. Kept at -20 degrees to slow metabolic reactions further, and shielded behind concrete capable of withstanding a plane crash from nearby Gatwick airport, the seeds are in capable hands. Sadly, not all of the seeds at Wakehurst are willing to be dried and frozen away, especially tropical plants, which are considered unorthodox, or recalcitrant. The act of drying these seeds would kill them, making them useless for experimentation and growth, and so more extreme measures must be taken. In a process known as cryopreservation, the seeds have their embryos removed and stored in liquid nitrogen, at -196°C. If even this fails, there is always room in Wakehurst Place’s extensive botanical gardens for the more stubborn plants, that must be grown to preserve for future generations. It was a true privilege to be allowed a behind the scenes tour of the Millennium Seed Bank, looking into the ingenious ways samples are preserved, and glancing into the freezing vaults where the hope for thousands of endangered and rare plants are being stored, ready to be used in the next medical breakthrough, or cultivated to preserve dying species of plants all across the world.